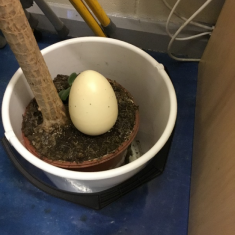 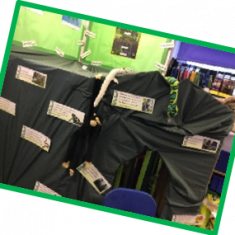 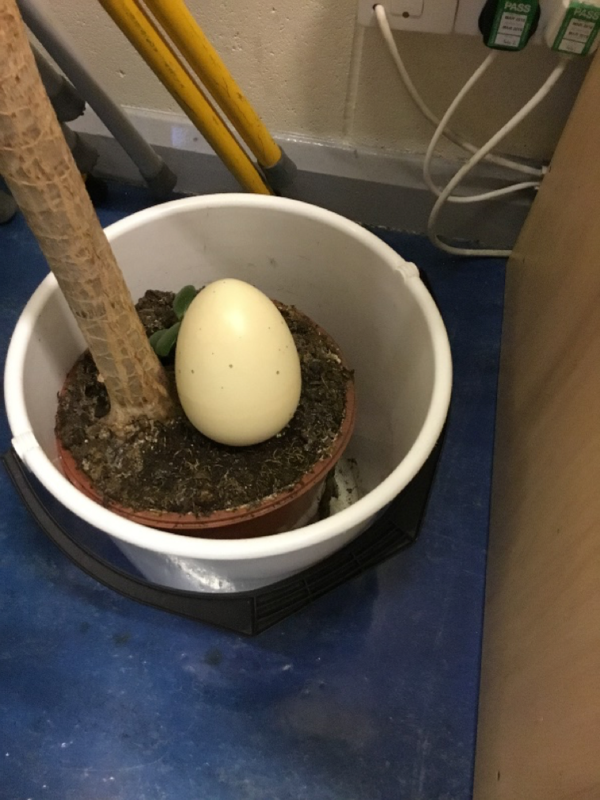 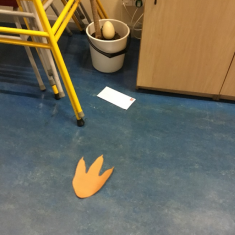 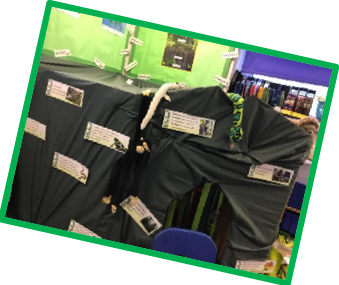 To start out KS1 topic ‘Prehistoric Predators’, we had a visitor at our school. 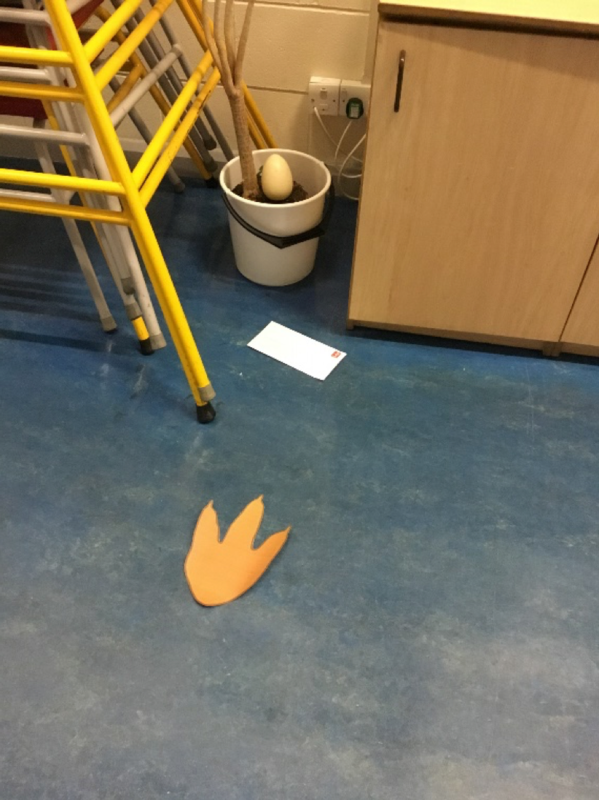 They left footprints, a tooth, a bone, a letter and an egg. 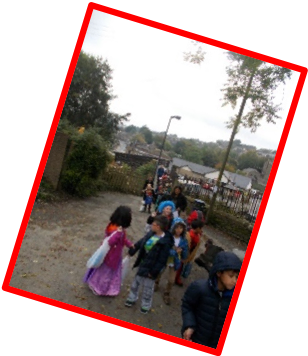 As a class we had to predict what the story was about and who had come to visit. Our predictions are that a dinosaur came to visit!!! 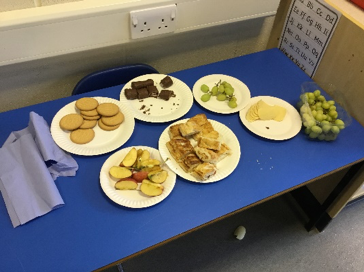 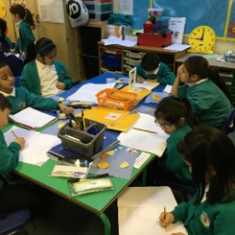 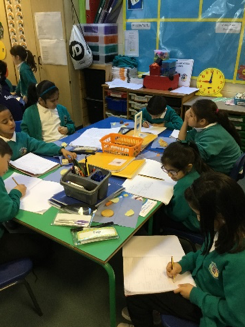 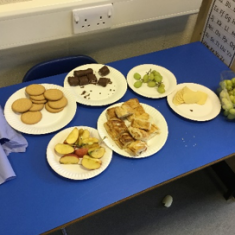 As part of our prediction phase in English we all had a feast of our own to describe our senses whilst eating food. 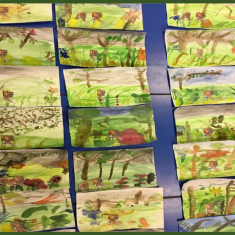 In Science we made our own food chains using the animals on our paper. 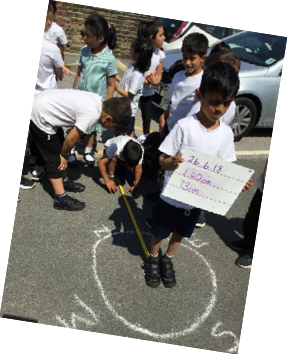 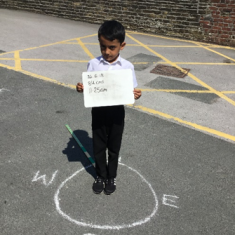 In Science we were learning about Summer and the length of the day. 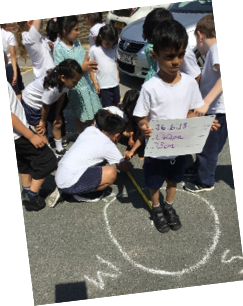 We went outside and measured our shadows at different parts of the day and discussed what happened to the length. 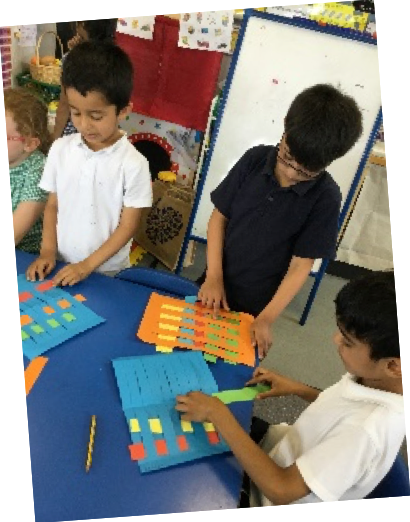 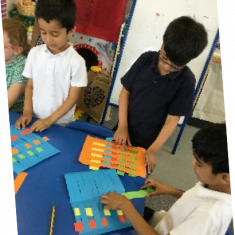 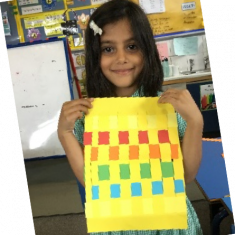 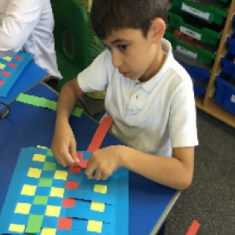 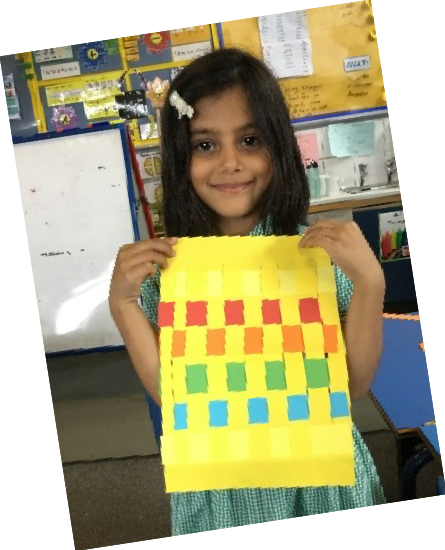 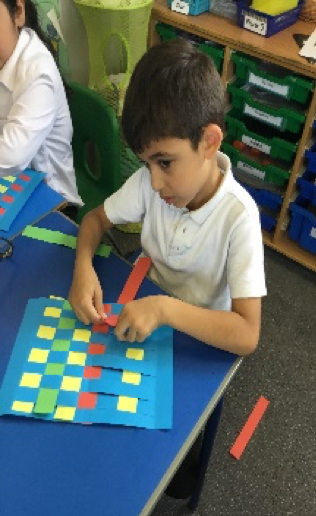 We learnt how to weave, we had to use our motor skills to thread the paper through the slits. 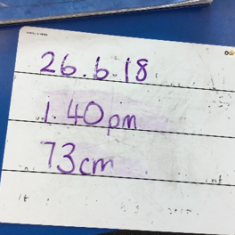 It was quite tricky but enjoyable. 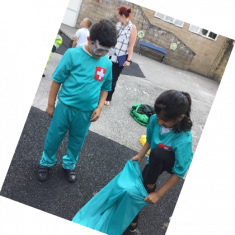 We had a visit from The Ambulance service. 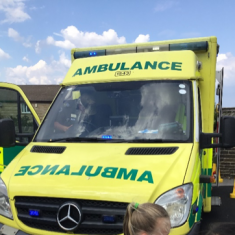 They showed us how they helped people, we pretended we were part of the crew and even got to see inside the ambulance. 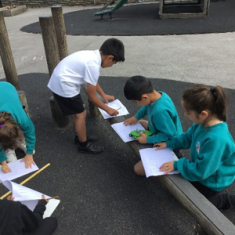 In Science, we looked at the sunshine and shadows. 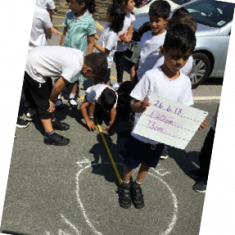 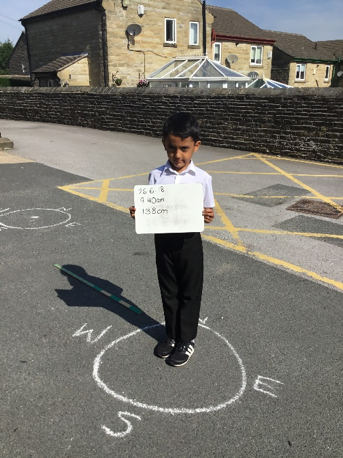 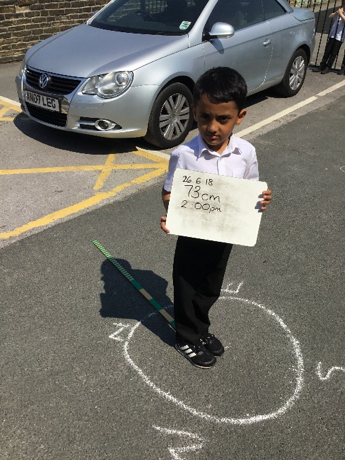 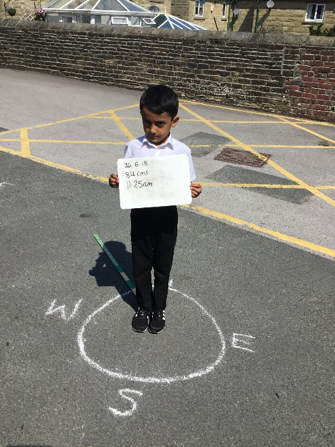 We went outside at different times to measure the size of our shadow. 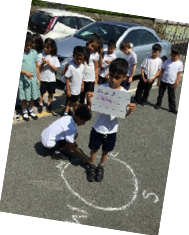 Then we came together to talk about the sun moving. 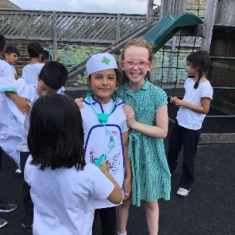 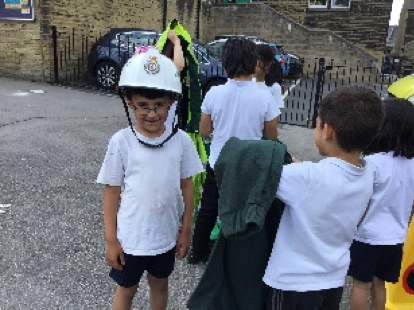 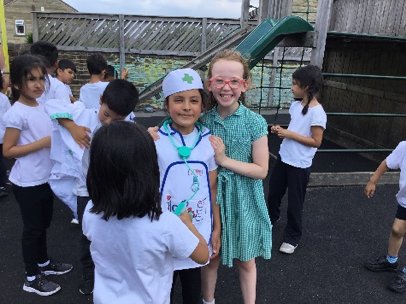 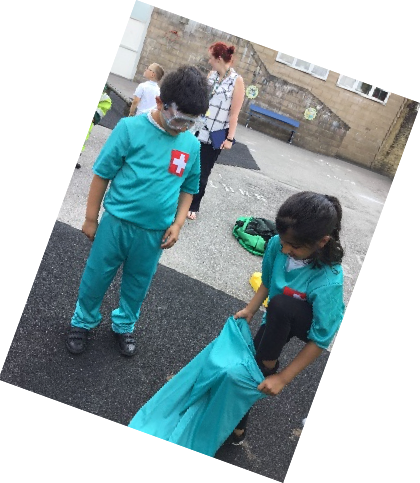 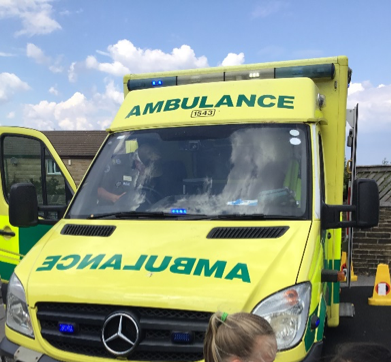 Year 2 had a great day when the ambulance crew came to visit. 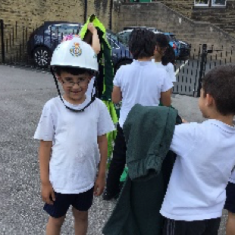 They got to try on their uniform, look inside the ambulance, give CPR and listen to the sirens – they were loud!! 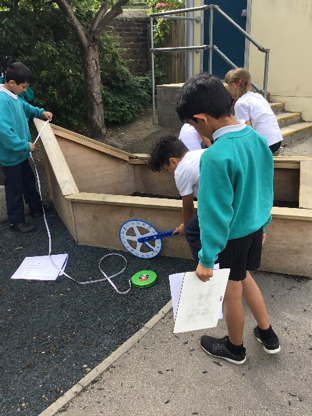 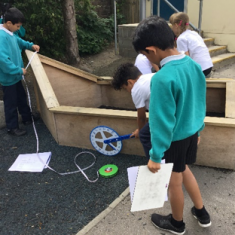 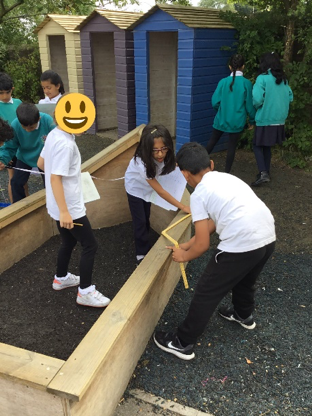 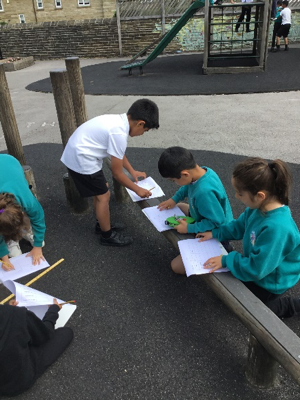 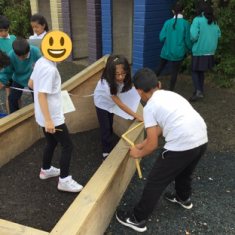 In Maths we learnt about measuring so we took our measuring sticks outside to look at the playground. 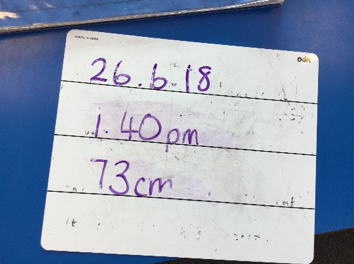 We measured lots of things that were bigger than items in our classroom. 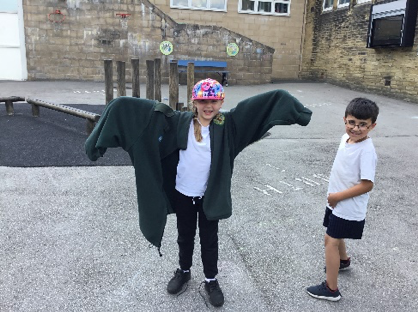 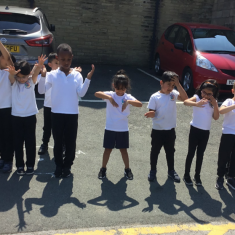 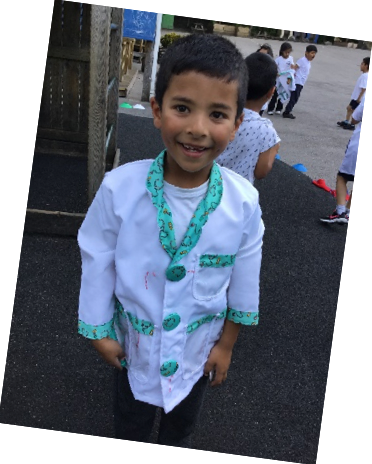 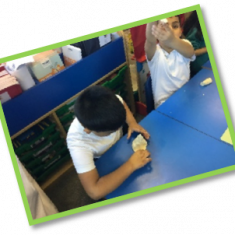 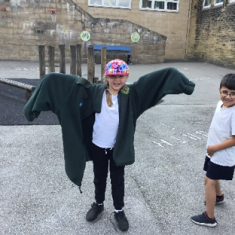 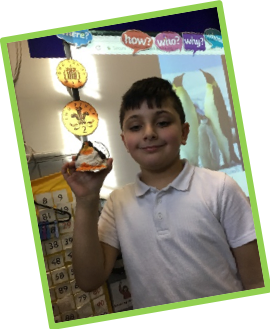 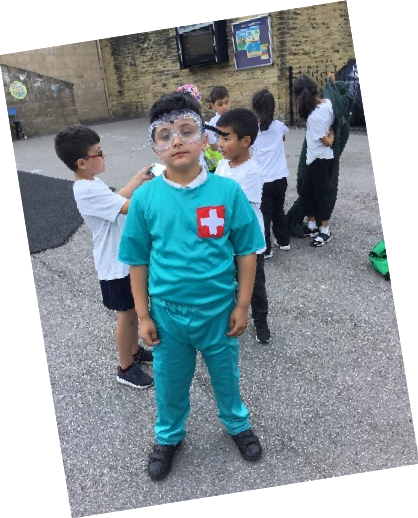 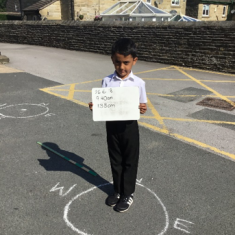 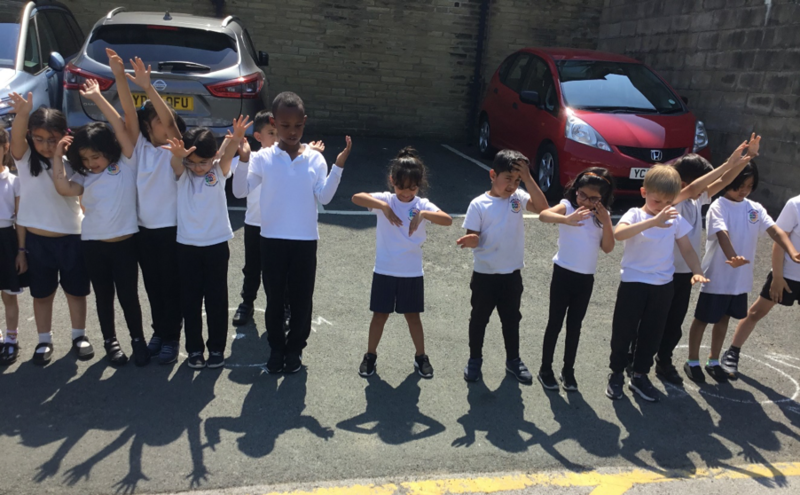 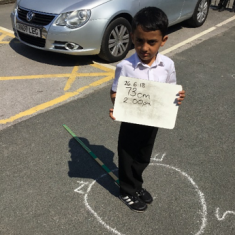 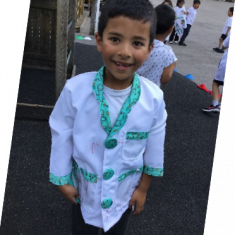 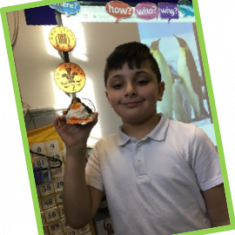 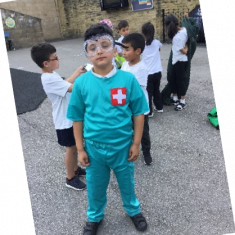 In Priestley have been enjoying our Summer Science lessons. 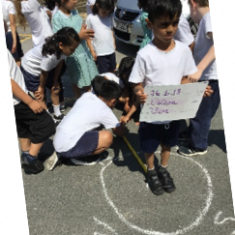 We have been measuring our shadows and noticing how the height of them changes throughout the day. 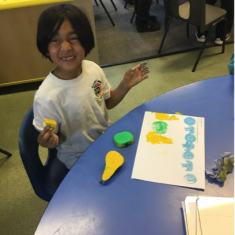 Priestley have been using fruit to create art work. 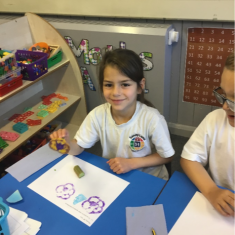 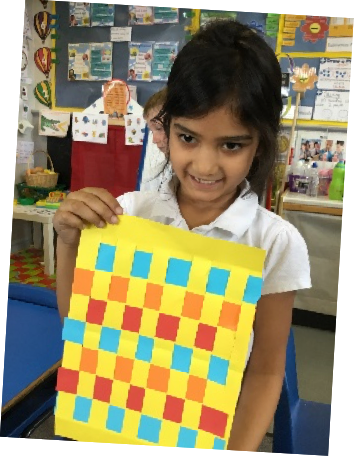 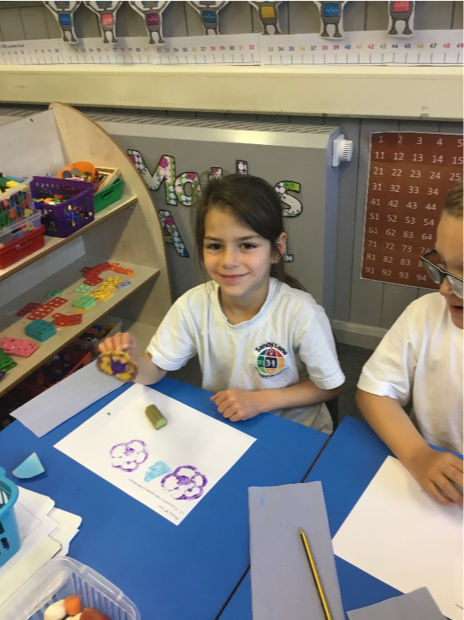 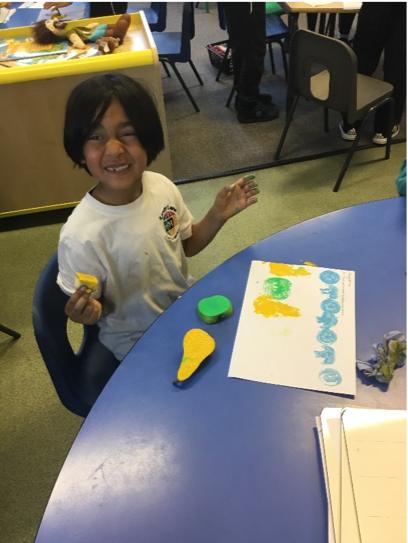 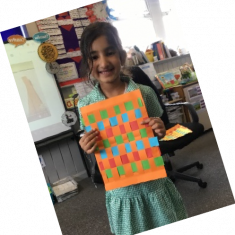 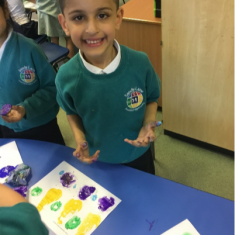 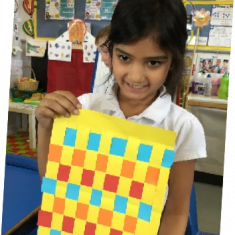 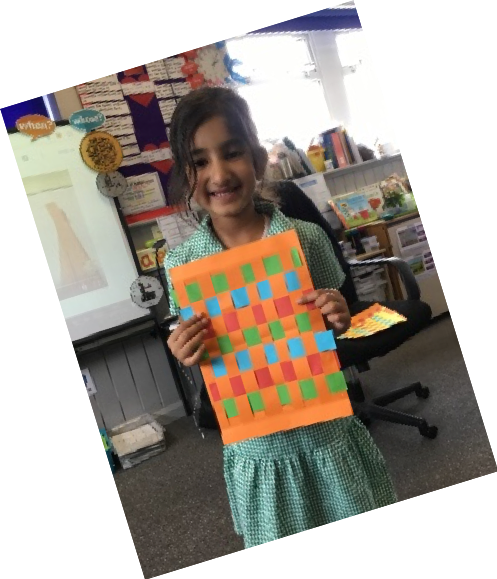 We have been using the natural patterns on the fruit and vegetables to create prints. 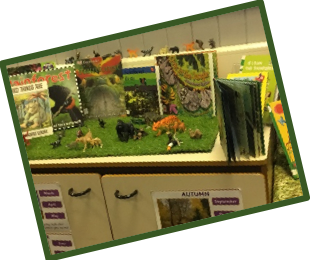 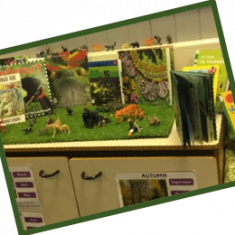 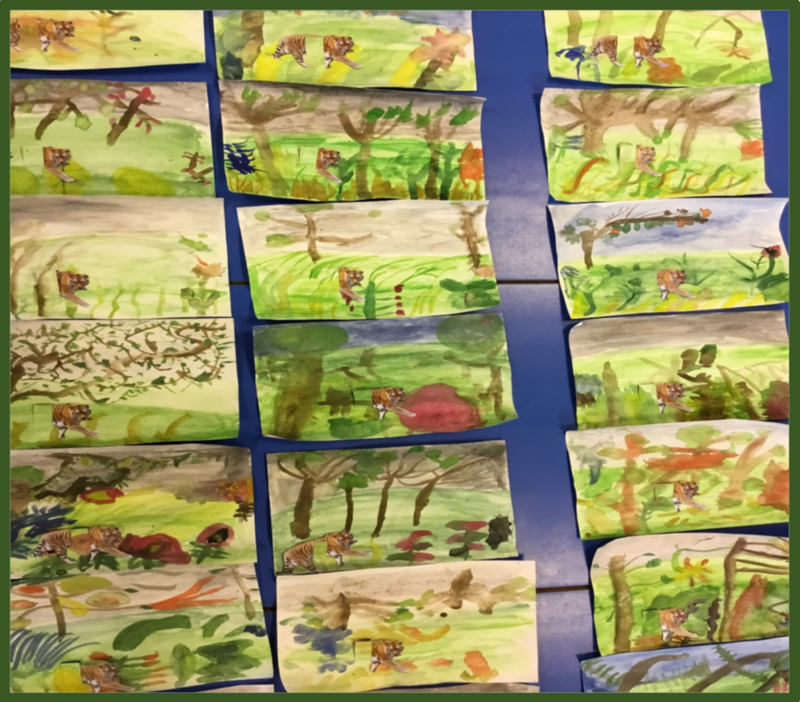 In Spring 2 our topic is ‘Rainforests’ . 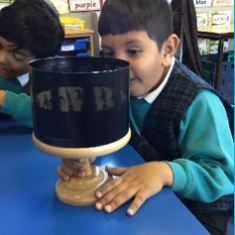 We will be finding out all about where they are and what they are like. 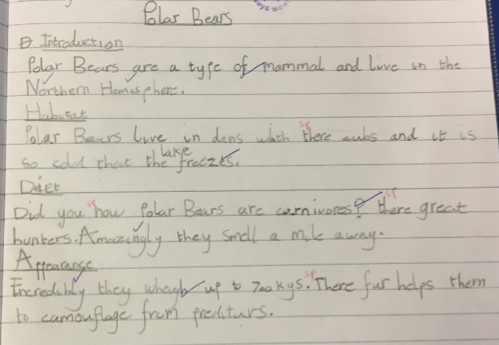 We will also look at which animals live there and compare the cold places and the warm places. 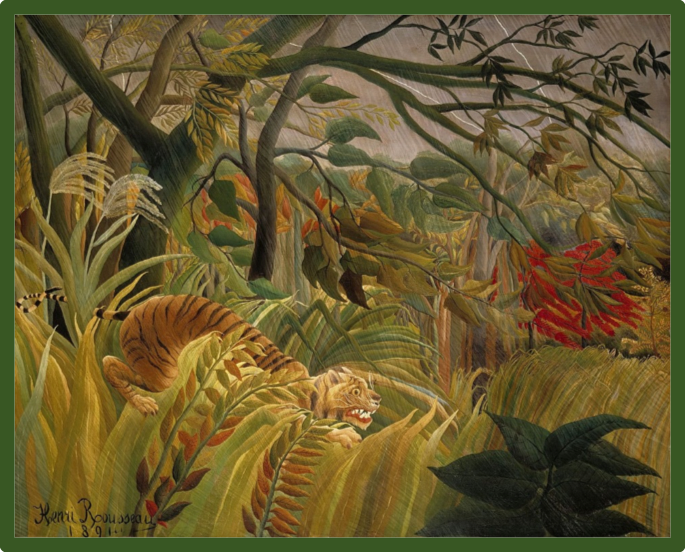 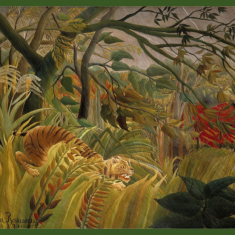 We learnt about Henri Rousseau and how he began his amazing journey to being a talented artist. 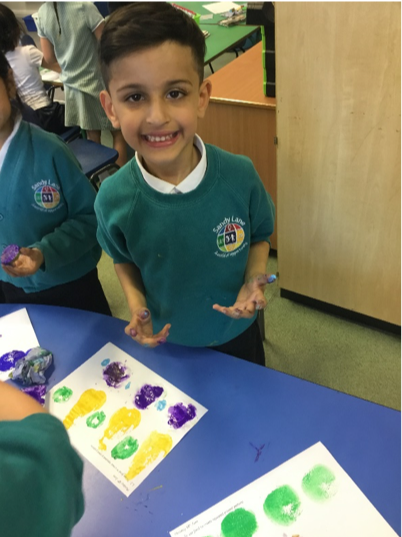 We used watercolours to re-create his famous picture ‘Surprised Attack’. 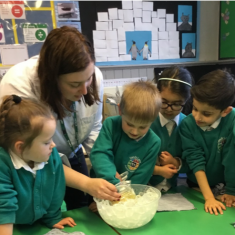 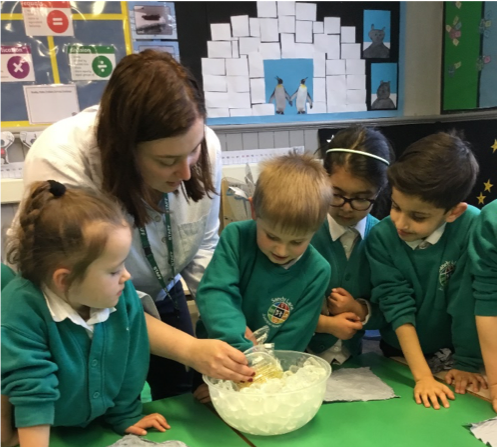 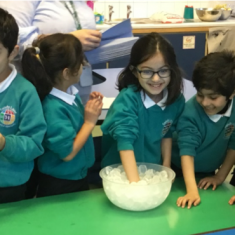 This half term in Science we were learning all about cold places. 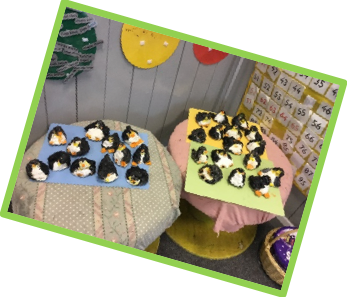 We conducted a science experiment to find out how animals stay warm in cold weather. 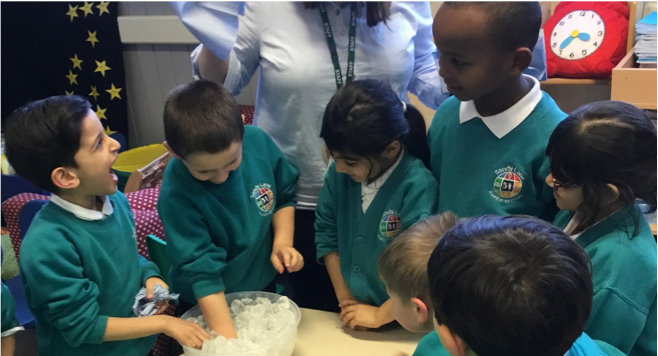 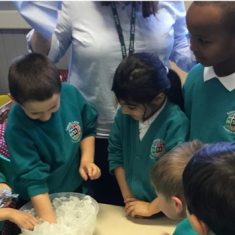 We dipped our hand in a bowl of ice using different materials to protect our hands from the cold. 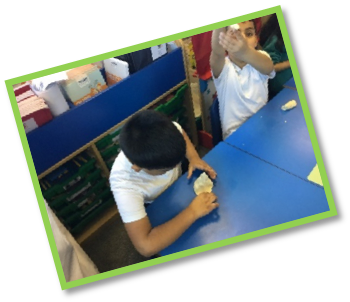 Once we had tested all of the materials we decided which one was the best at keeping our hand warm. 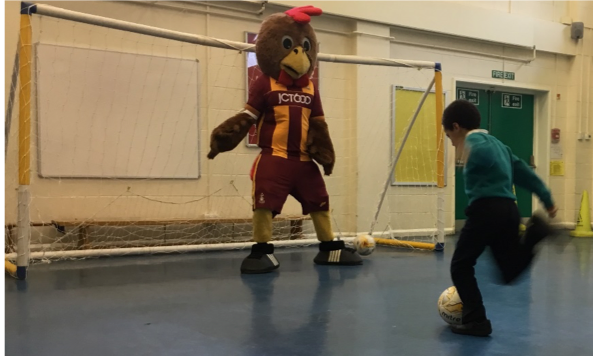 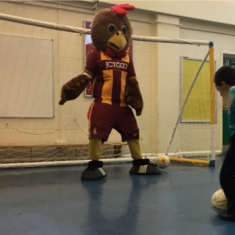 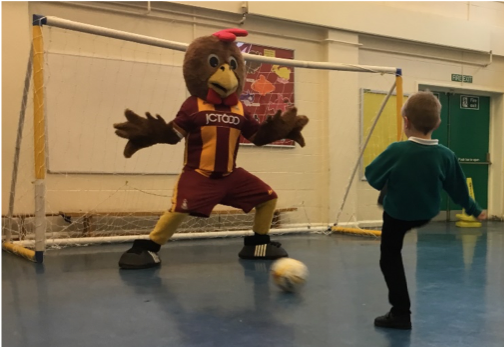 We took part in the Bradford City penalty shoot-out. 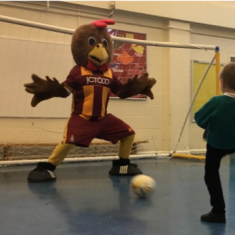 We tried our best to score a goal past Billy Bantam. 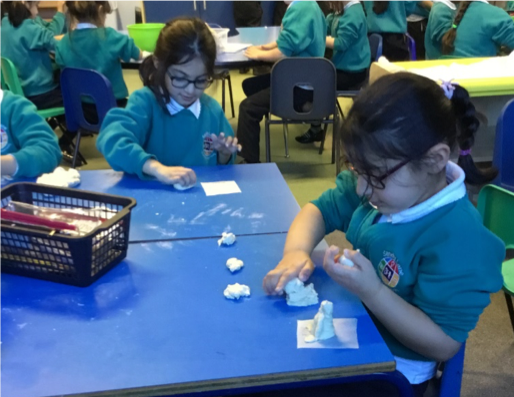 As part of our Winter Wonderland topic we created penguins out of salt-dough. 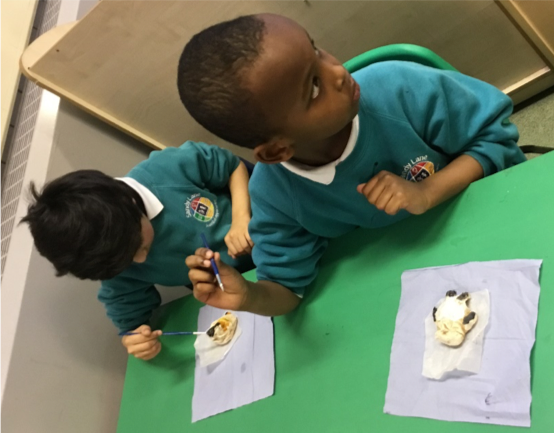 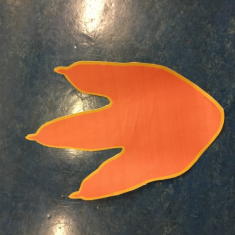 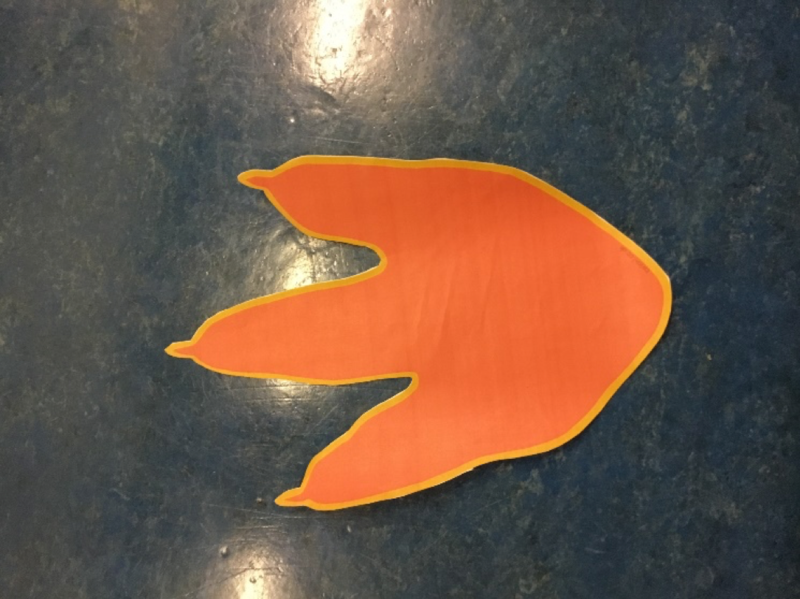 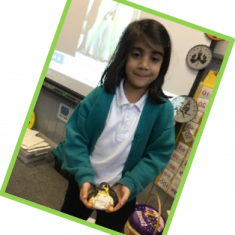 We carefully shaped them out of the dough – we had to be especially careful when creating the smaller parts like the feet and the beaks. 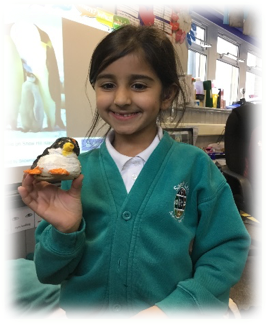 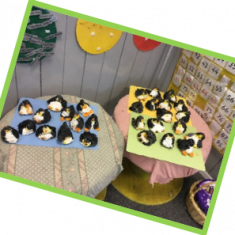 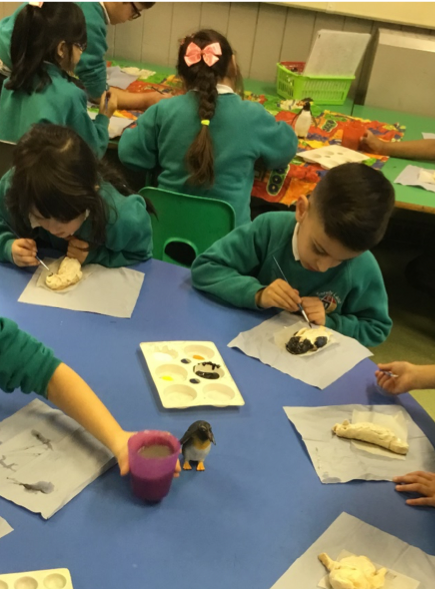 Once they had dried out in the oven we painted them with acrylic paints to bring our penguins to life! 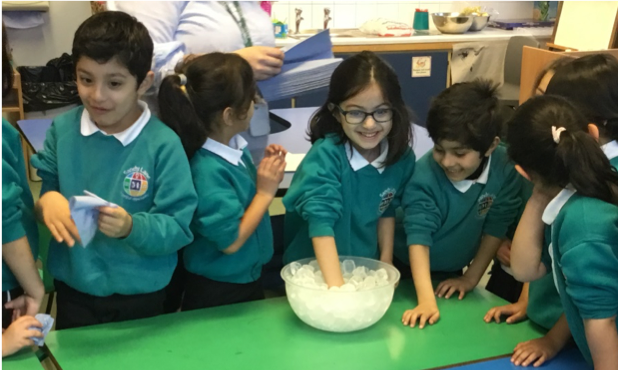 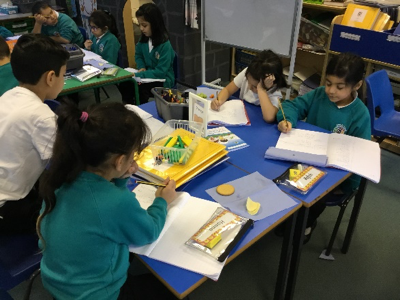 Our first topic was ‘ Winter Wonderland’ in Spring 1 .We explored the cold places in the world and found out all about where they were and who lived there and what animals lived there. 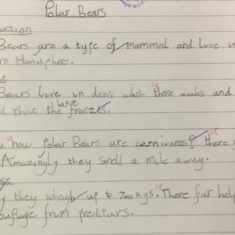 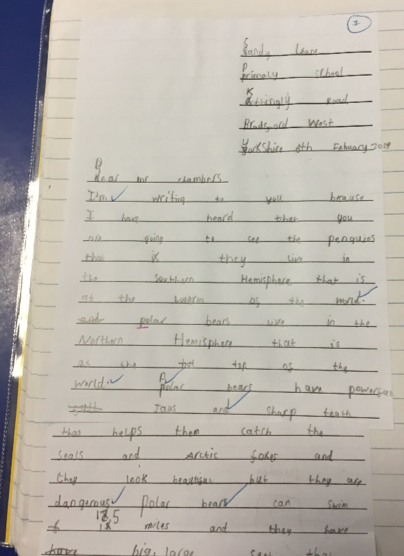 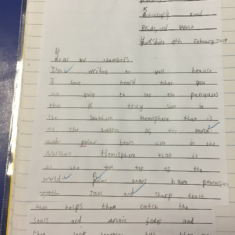 We received a letter from an explorer asking for his help to find out about the animals, we then wrote reports and a letter back to him. 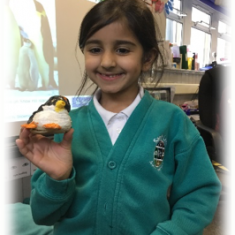 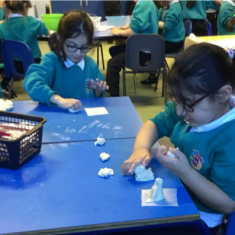 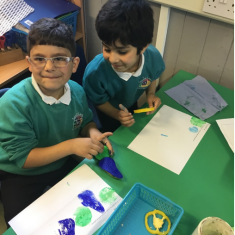 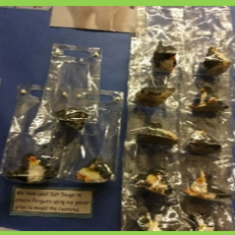 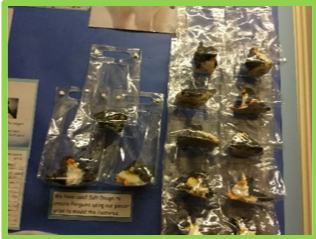 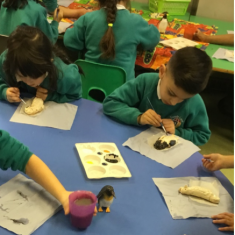 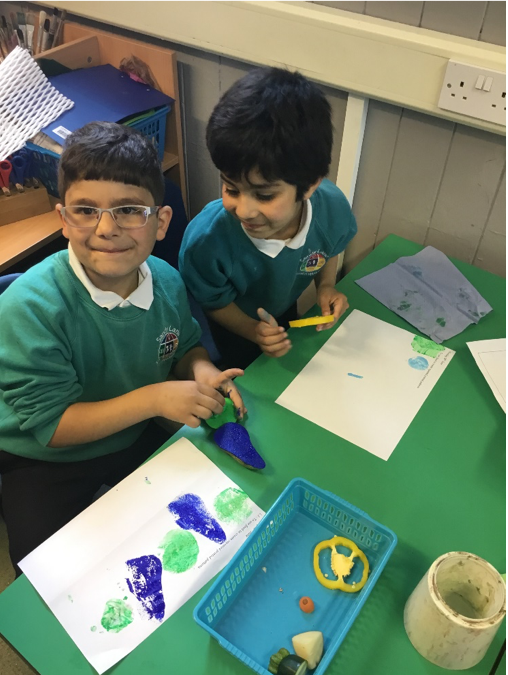 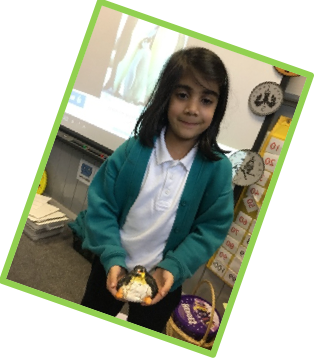 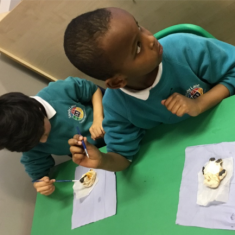 We used salt dough to make penguins, using our pincer grips to help us mould the shape of its body and features. 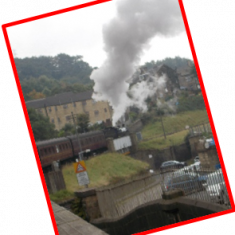 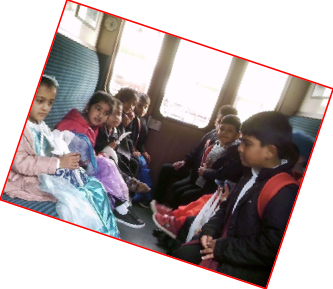 To start the new year as a school we all went on a steam train to Haworth. 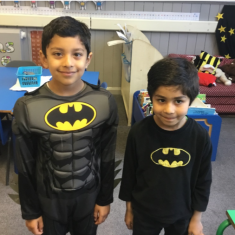 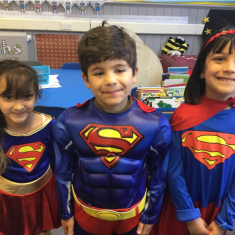 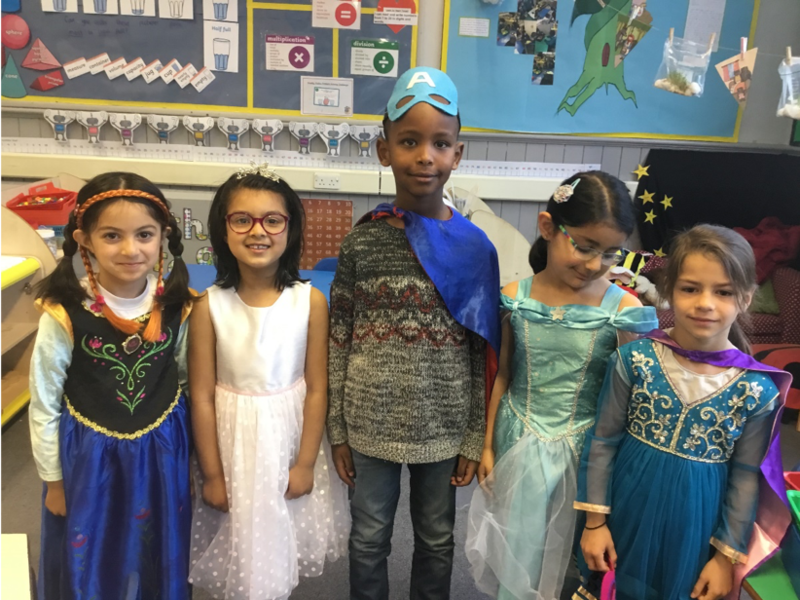 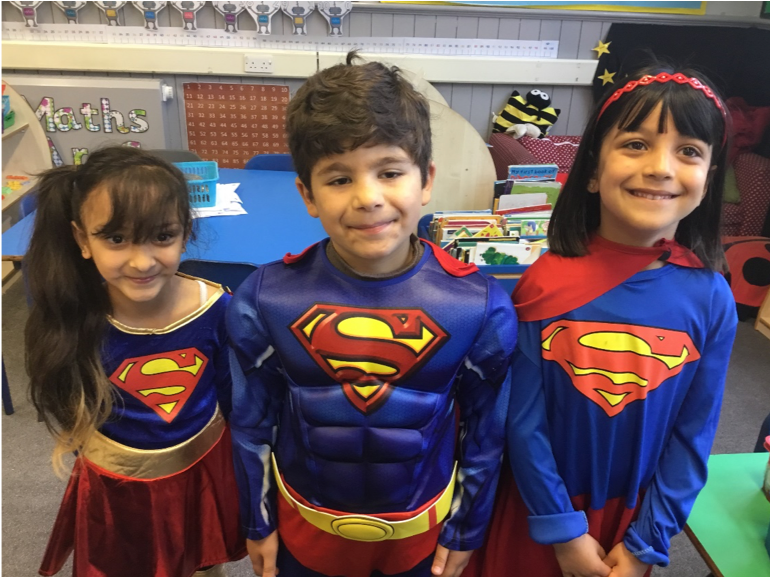 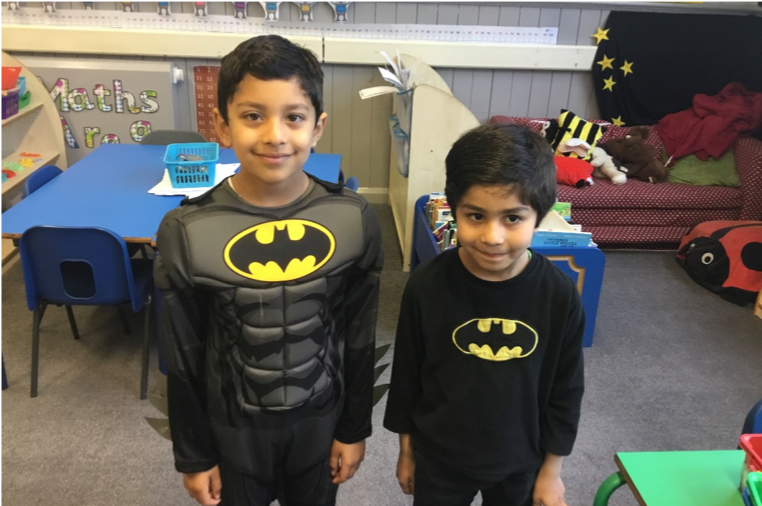 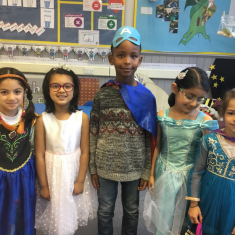 We wore costumes linked to different book characters. 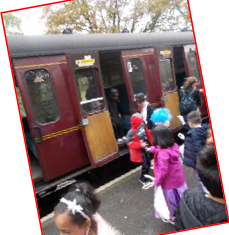 We had lots of fun and were amazed by the fantastic train. 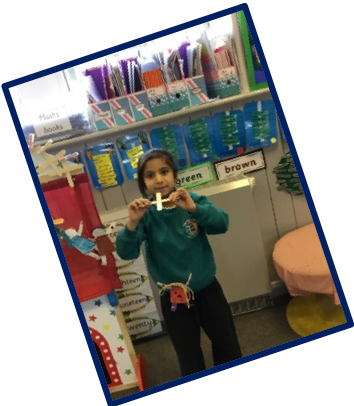 Our Topic was ‘Toys’ and we had a special visitor come in and share with us her toys from a long time ago. 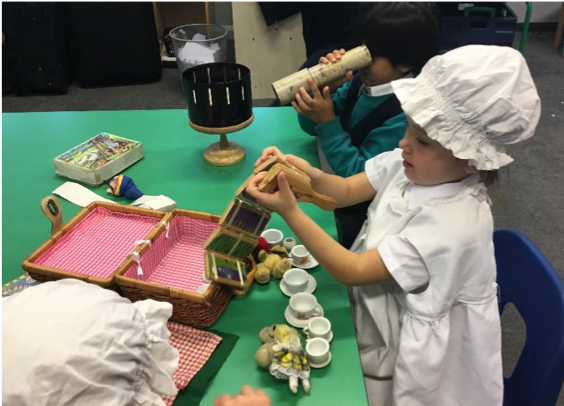 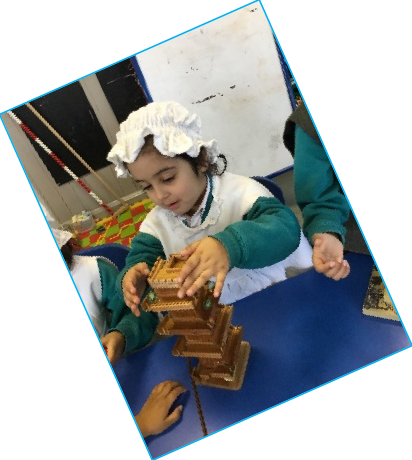 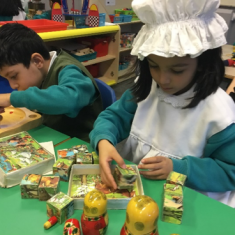 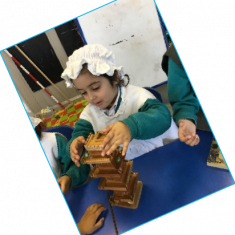 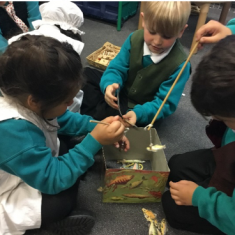 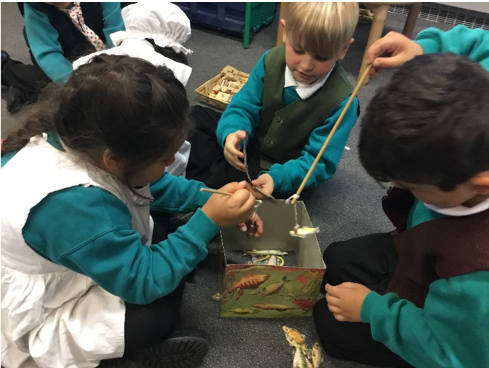 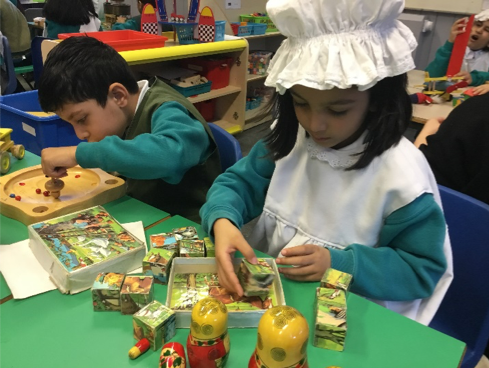 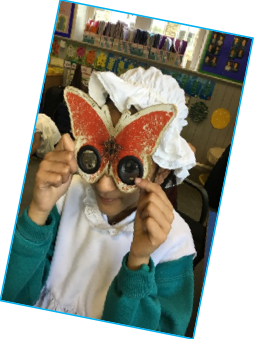 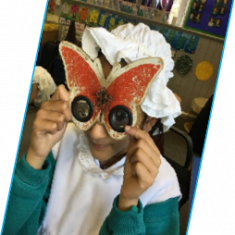 We talked about what they were made of and how they worked and we played with both indoor and outdoor toys from the Victorian times. 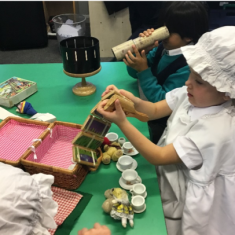 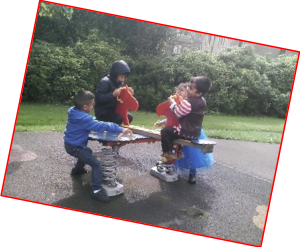 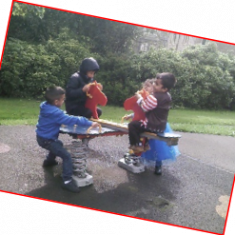 We loved the toys and wished that we were children in Victorian times. 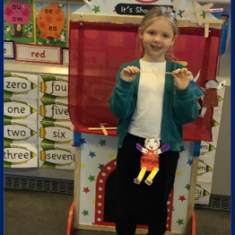 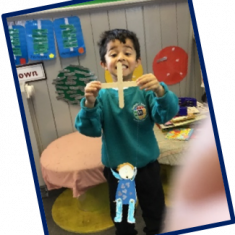 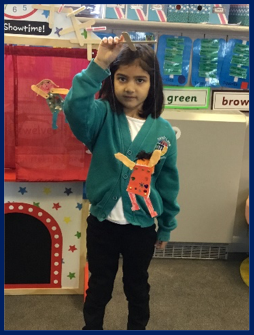 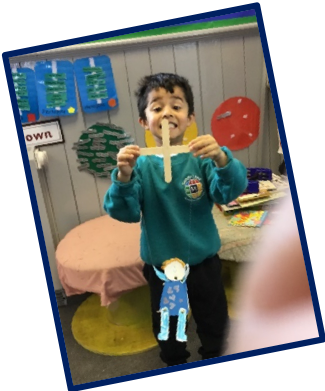 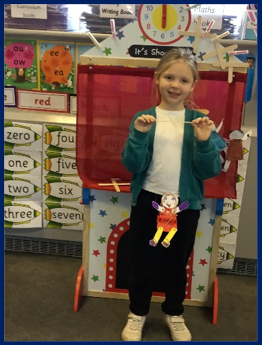 We designed and created our own puppets and put on a puppet show. 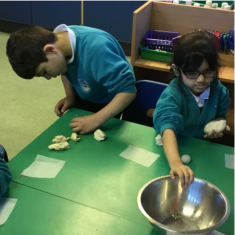 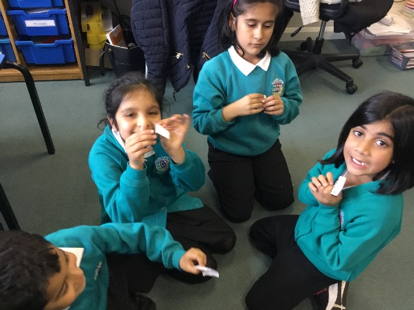 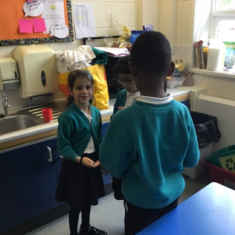 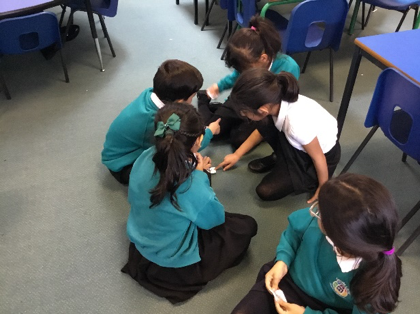 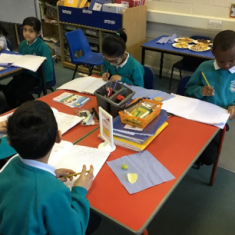 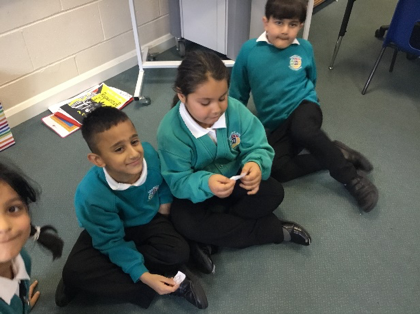 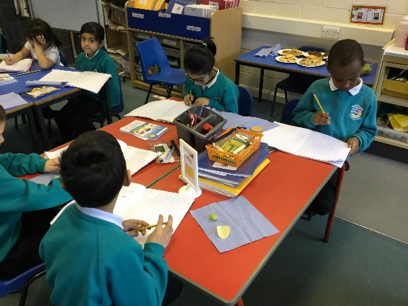 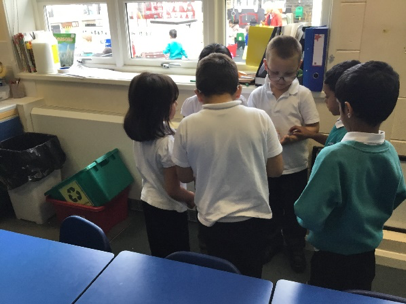 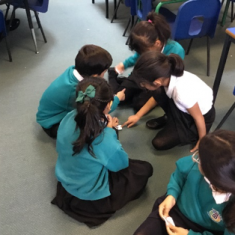 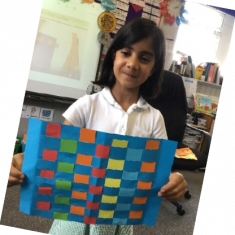 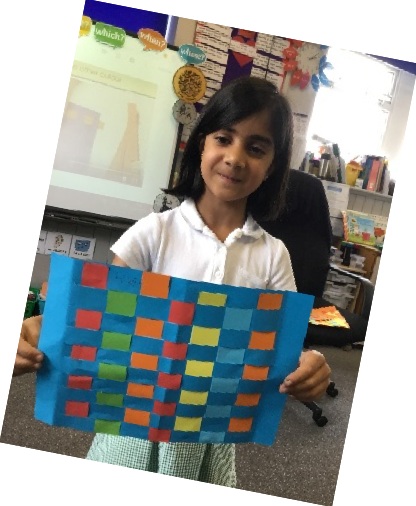 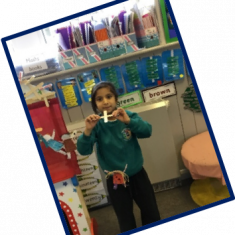 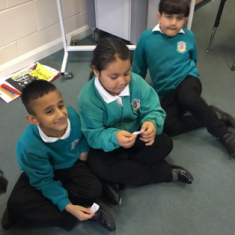 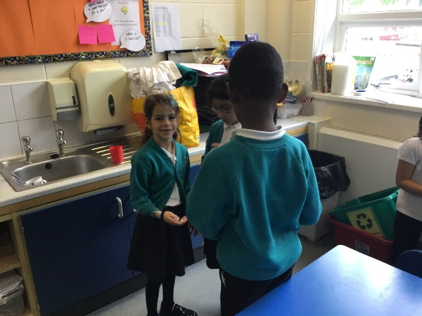 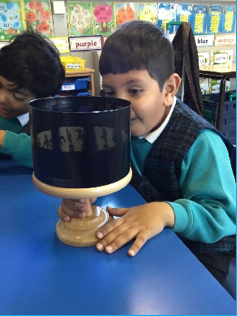 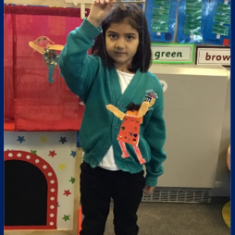 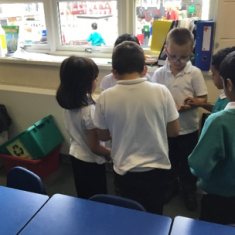 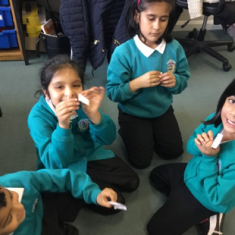 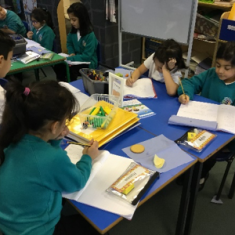 In Science we have been learning about different types of materials. 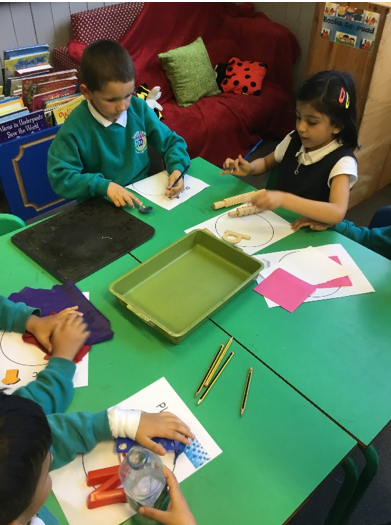 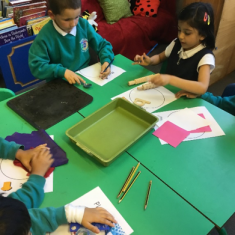 We worked together to sort different objects and we put them into categories based on the materials they were made from. 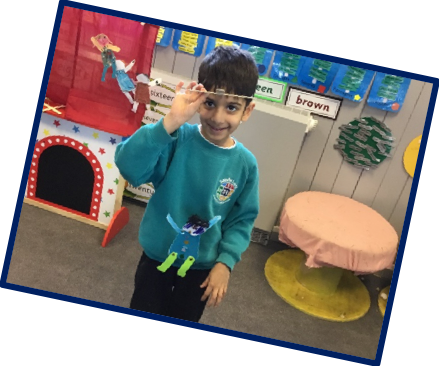 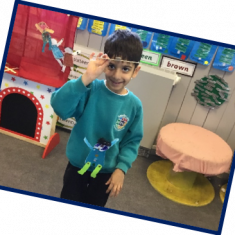 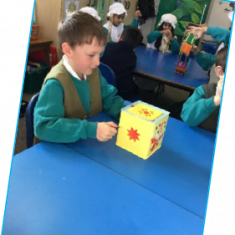 Our topic this term is Toys. 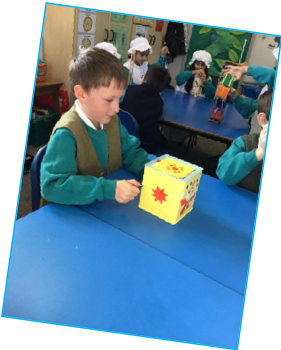 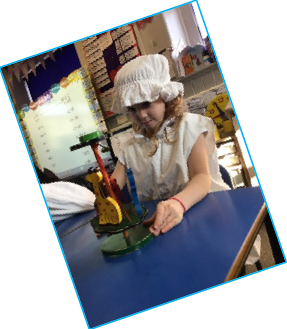 Mrs Garside came in to show us toys that children from the past enjoyed playing with. 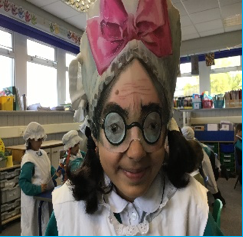 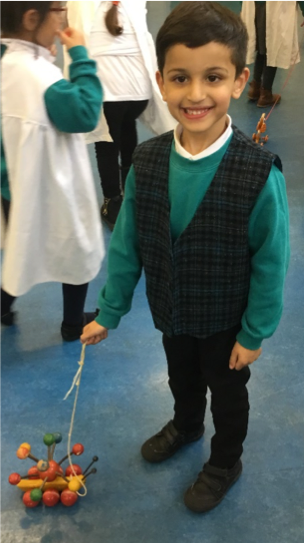 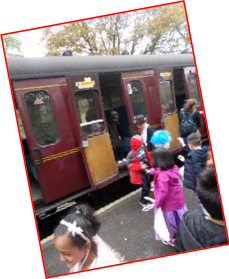 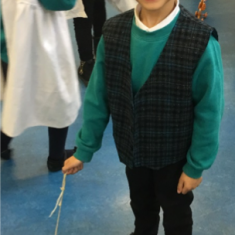 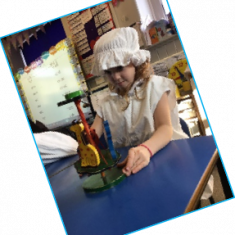 We had a fantastic time travelling back in time! 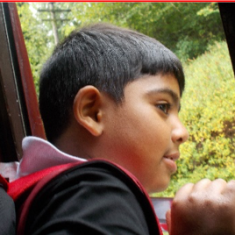 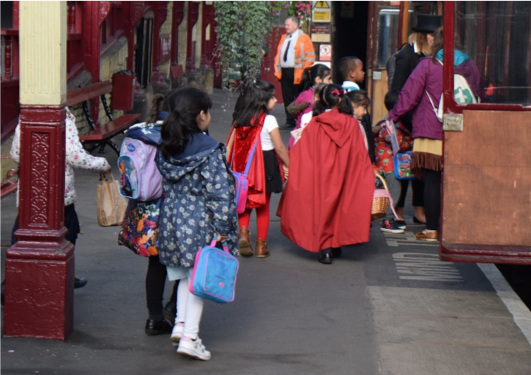 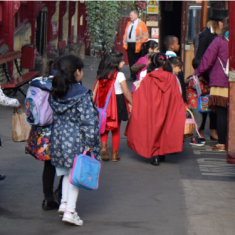 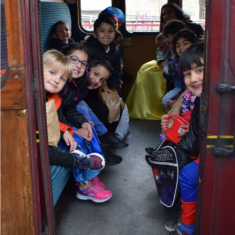 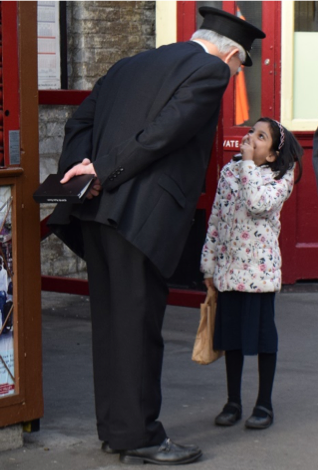 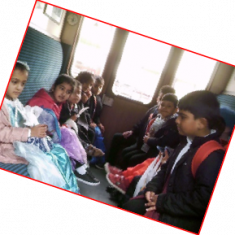 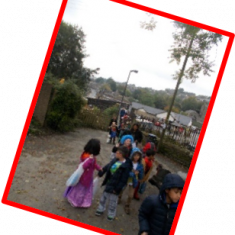 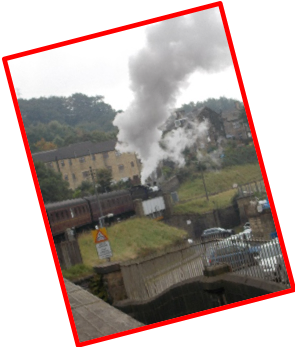 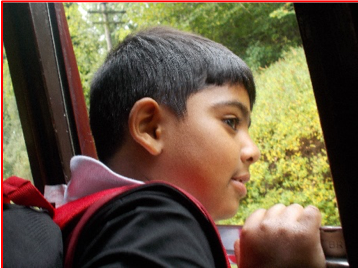 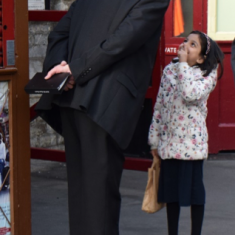 We went on a whole school trip to the Haworth and Worth Valley Railway. 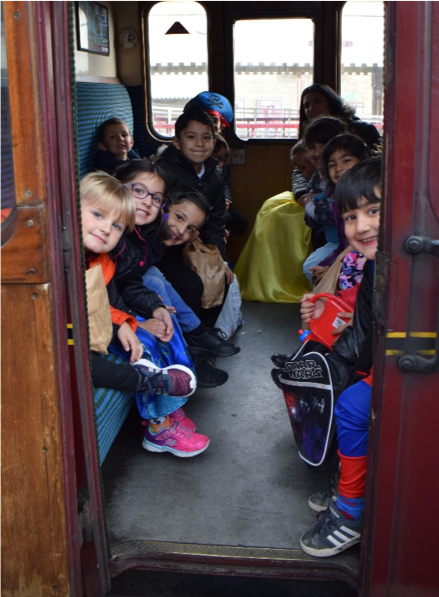 We were all very excited to go on the steam train dressed as our favourite characters.